Couple of you have asked me for a recipe for dúkatové buchtičky. This is a dish I remember fondly from my childhood. 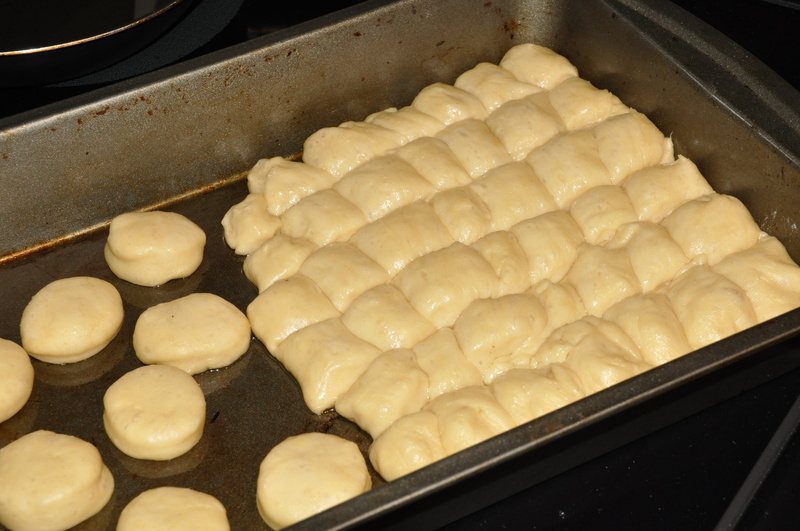 It was a common staple in my elementary school cafeteria, along with ryžový nákyp, probably because they both can be made easily in mass quantities and are popular with kids since they are both sweet. In Slovakia, we have a number of sweet main dishes. This is something I don’t believe is common in the American cuisine. Some other examples include plum dumplings, cabbage flakes, noodes with poppy seeds, and apple bread pudding. Unlike the traditional buchty, which are filled with apricot jam or cottage cheese, these are not filled. 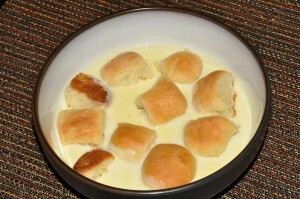 Instead, they are soaked in a vanilla cream. This makes them somewhat similar to bobalky. In making this dish, I followed the recipe from mimibazar. I also found another recipe in one of the Slovak cookbooks I have, however, that recipe was for some fancier kind I am not familiar with that had layers of ground nuts. 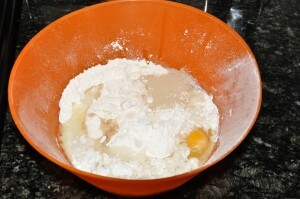 Mix all the dough ingredients together until you get a smooth mixture. 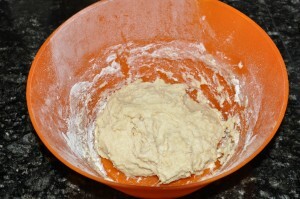 Cover and let rise for few hours. 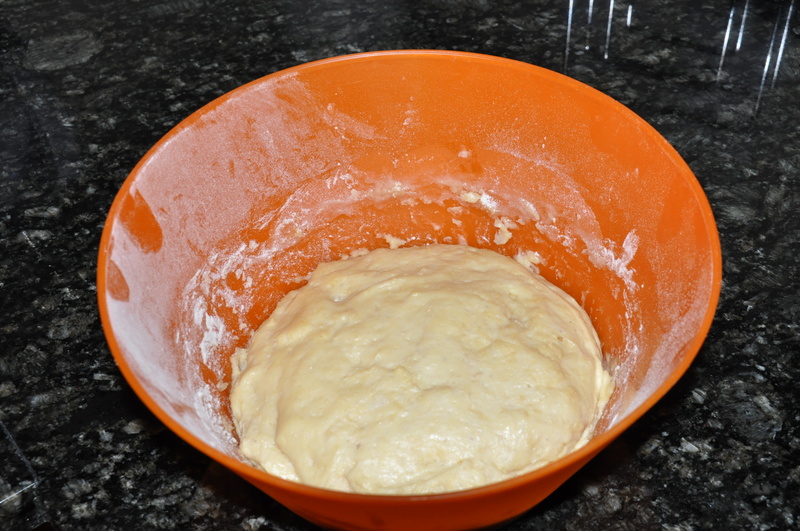 You will end up with a smooth dough. Transfer the dough onto a board dusted with flour and form into a loaf. 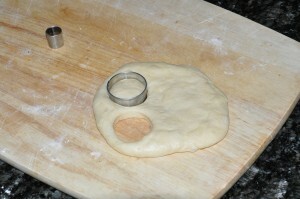 Then cut into a number of slices. 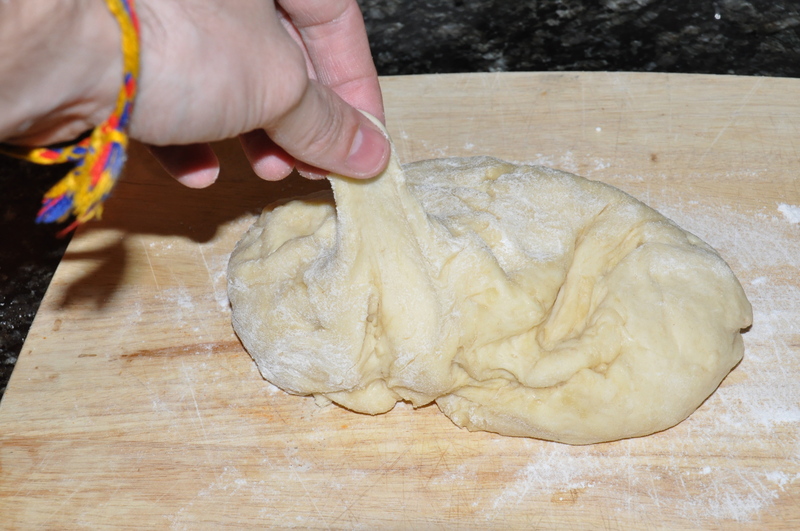 Take each slice between your palms and roll until you get a smooth cylinder. 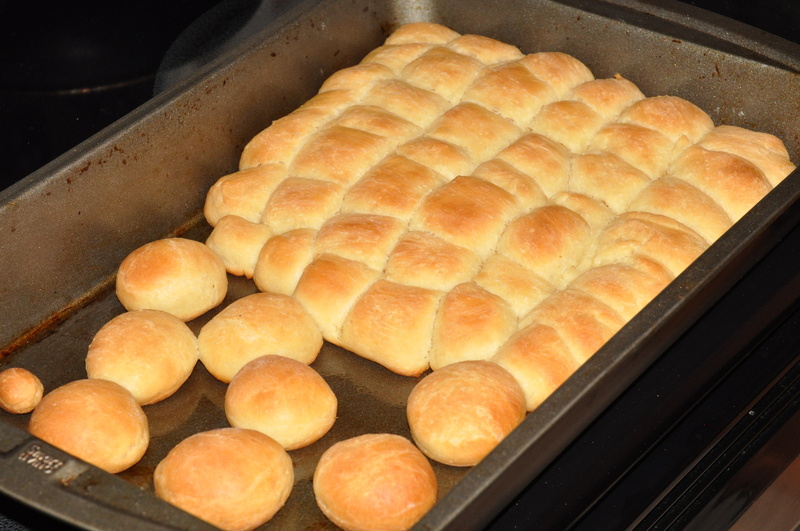 Transfer the rolls onto a greased baking pan. 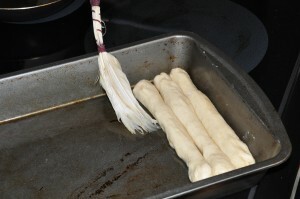 Brush oil onto the outside side that will be touching another roll to prevent them from sticking. 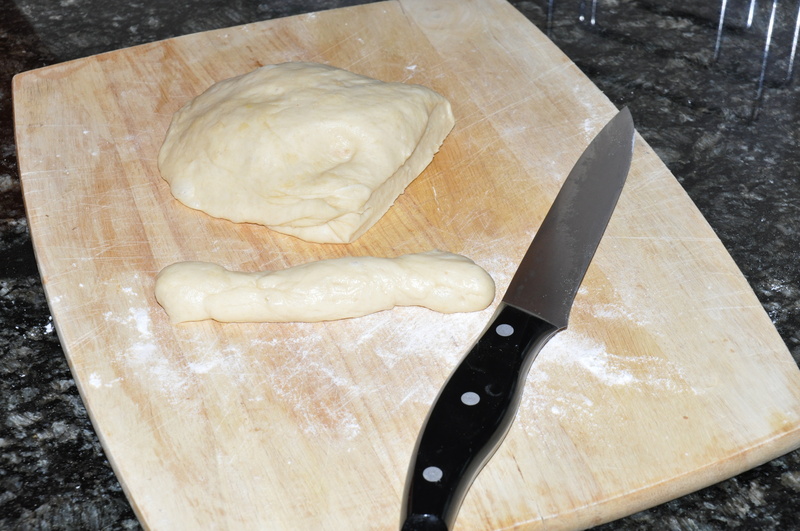 I also tried cutting out few buns with a circular cutter. Next take a greased spatula and use it to make perpendicular cuts so that you end up with a small square buns. Let rise for about 30 minutes. In the meantime, preheat the oven to 375F. Bake for about 20 minutes. 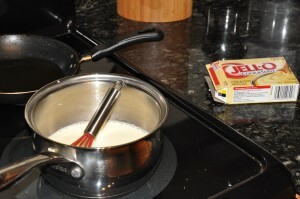 While the dough is baking, prepare the cream. 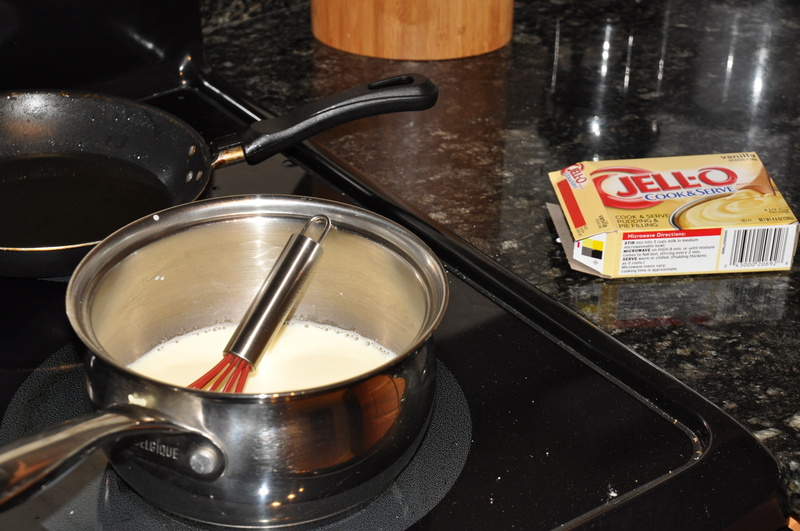 You could make vanilla cream from scratch by combining corn starch, milk, and vanilla sugar, however, I took the easy way and used one of the Jell-o cook-and-serve vanilla puddings. I didn’t measure the amounts but the important point is to use much less pudding mix than when making pudding so that you end up with thin cream instead of a thick pudding. To serve, separate the buns once they are cool enough to handle and add to the cream. Enjoy! 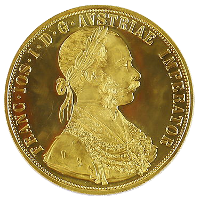 Prave vcera som ich robila. Mnam, milujem ich. HI, I am interested in Buchtickys.. My husbands mother used to make them every Christmas eve but she would cover the steamed bread that had been dipped in melted butter with crushed gingersnaps and dark karo syrup. I would like to know if there is a actual recipe for this or was it perhaps tailored for when my husband ancestors immigrated to the US. I am sure they didnt have access to fresh produce and then just used things that had a better shelf life. If you could, would you email me your thoughts. I am not very good at this computer stuff and I know I will never find where I wrote this again. Hello, we have this Christmas tradition in our family that dates back to my great great great grandmother who was born in Radomysl in the now Czech Republic. However, our tradition seems to be a combination of Buchtickys and Bobalky as our little bread balls were covered in warm milk, poppy seeds and maple syrup. Again, I’m wondering if as immigrants to the United States they just didn’t have the necessary ingredients for the vanilla cream or that the tradition changed over time as it was passed from generation to generation. Does anyone have this same tradition with the milk poppy seeds and syrup?